Global Partners has applied for permits to expand its oil terminal facilities on the Hudson River, including one directly across from Beacon, to a capacity of 1.8 billion gallons of per year. According to a presentation last night at the Newburgh Free Library by Scenic Hudson and Riverkeeper, the permitting process involves Federal and State agencies as well as the town of New Windsor planning board. Attendees included local town and county elected officials, riverfront property owners, and the Newburgh assistant fire chief. Most of the train tanker fleet consists of DOT-111 railcars, which are do not have pressurized tanks or puncture-proof hulls. Compounding the problem, the Bakken is a light oil that is more volatile than conventional crude, making it more prone to explode when spilled. The most recent derailment occurred at the end of April in Lynchburg, Va. In that incident, the river briefly caught on fire. The terminal property is on the riverfront, on the southern border of Newburgh in the town of New Windsor. Oil at this facility mostly comes and goes by train, but the company is also looking to expand its dockside capabilities, and to add boilers that will help make oil from the Canadian tar sands, which has a sludgy consistency, more suitable for transport by barge or ship tanker. In this process, the thick crude is heated, then cut with diesel fuel, benzene, or other chemicals. Currently one barge a day carrying 4 million gallons leaves from Global’s other terminal at the Port of Albany, which is also scheduled for expansion. Approximately once a week, the tanker Afrodite picks up 8 million gallons. Neither spill responses nor emergency derailment responses have been updated to deal with emergencies. In the case of a river spill, it is estimated that approximately 15% of Bakken oil and 5% of tar sand oil would be recoverable. The tar sand oil hardens and sinks quickly to the river bottom. Due to the volatility of the light Bakken crude, the new oil storage tanks proposed for New Windsor must be equipped with floating roofs to relieve pressure build-up. The plan calls for the tanks to be built on the riverfront in a brownfield zone between two existing conventional oil storage tanks. The company will remediate the brownfield area, which would include removing oil-contaminated soil, before building the new tanks. A spill into the Hudson River, either by a train derailment or barge or tanker accident, could impact tidal estuaries, public drinking water, and the region’s $4.75 billion-dollar tourism industry. Scenic Hudson, Riverkeeper, and others are calling for an immediate moratorium on the use of DOT-111 railcars for the transport of oil, via emergency order from U.S. Secretary of Transportation Anthony Foxx. At the meeting, Riverkeeper Paul Gallay called it the existential problem of the Hudson River, and Scenic Hudson president Ned Sullivan called it the greatest threat in his career to the economy, the river, and the region. 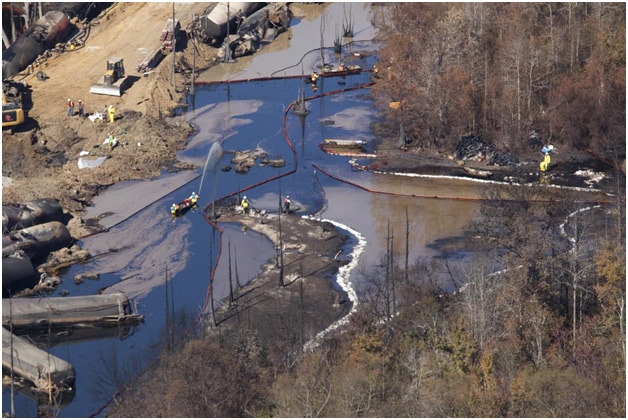 Feature image: Oil-soaked wetlands in Aliceville, Ala., following a November 2013 derailment of a train carrying Bakken crude oil. Photo by John Wathen, Hurricane Creekkeeper. Thank you for keeping us abreast of this issue. It’s very disturbing.